Technology does not go on lower gear; it keeps on magnetizing people and bringing them closer in terms of communication. No matter what miles apart your loved ones are, technology shortens the distances and brings people closer most as if sitting next to you. There was a time when even language was not introduced and people used to pass on the messages through hand and body gestures in the Stone age times. But life is much simpler now, we don’t have to send handwritten letters and notes to far off countries, we don’t have to sit days and nights for someone’s message or invitation all through the literatures. Emails and fax have been introduced, you can make calls, Facetime friends and Skype them around wherever you are. How farfetched this technology has gone and how mature we have become in our intra personal relationships. I cannot believe myself how differently this world has evolved. Smartphones, devices and gadgets/laptops have now taken technology to some other level of comfort and happenings. Let’s talk about the new launch of iPhone7, it is meticulously designed, not only the layout and user friendly interface, but the metal body is amazingly good, what finishing, what finesse, what design, my God. You cannot resist the temptation of it. The sleekness, the camera result, the specs and features are touching skylines. What excellence and quality is put up in this iPhone 7 one cannot put forward completely. Though it is pricey but worth the cost for sure. 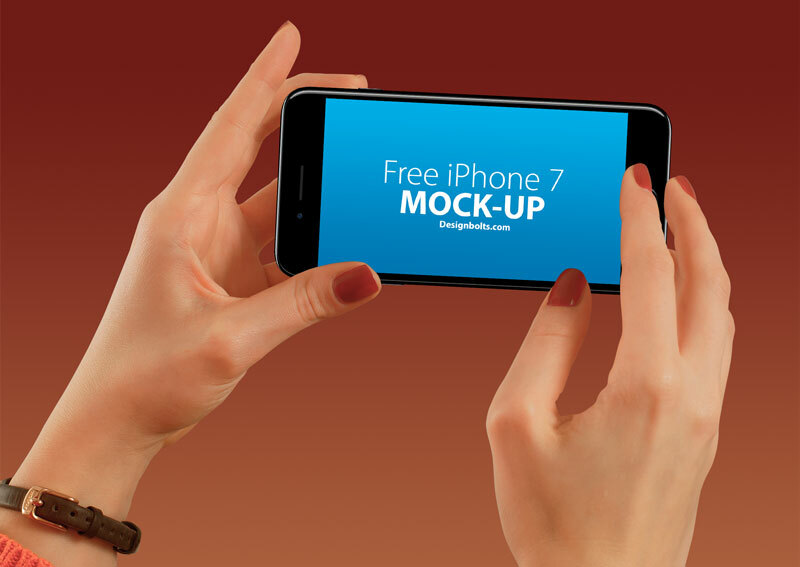 I am bringing before you free iPhone 7 hand mockup PSD. You can use this in your project if you get to show if off to your client in the presentation. Remember, clients never compromise on the presentation that you make; they keep a check how their product has been manifested in the mockup, so make you don’t give them any chance to get offended or disappointed. Have a look at it and let us know your design and art experiences. Here we go! You can change the mobile set or change any background. Don’t forget to say thanks in comment.